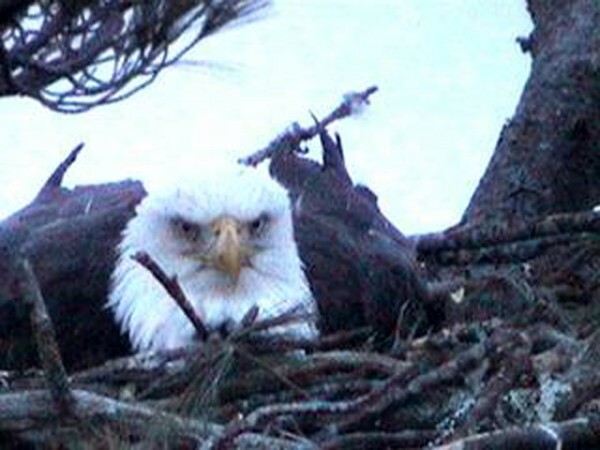 A recent photo of a bald eagle taken with the Nextera Maine Eagle Cam1 in Hancock County. ELLSWORTH, Maine — Two chicks have hatched in an eagle nest in Hancock County that is being monitored by biologists from Biodiversity Research Institute. The chicks hatched earlier this week and now are visible and being fed regularly, according to a press release issued Friday afternoon by the institute. The birds can be viewed live online at www.briloon.org via the NextEra Maine Eaglecam1, which is positioned at an undisclosed location in Hancock County. The webcam is one of two eagle web cameras set up and sponsored by NextEra Energy Resources and hosted and monitored by biologists from the Gorham-based Biodiversity Research Institute. The effort is coordinated with the Maine Department of Inland Fisheries and Wildlife and the U.S. Fish and Wildlife Service. “We have not had a successful hatch at this nest since 2007, and we hope for the best as these birds grow and prepare to fly. It is going to be quite a journey,” Patrick Keenan, Biodiversity Research Institute outreach director and coordinator of the institute’s webcam program, said in the release. The webcams are important educational and research tools, according to the biologists.